I suppose I should tell of the things I liked here. take a pill and then drink from a water-swollen lake. and if you approached with carrots or apples, you would know love and fear. drowning in magnetic surf, your own desire to be near horses. I would take sticks and make crosses, taping the pieces together. as I curled like a violin-scroll beneath a tree. I would awake, crosses at my feet, after a good sleep beneath an oak. on the line my father put up. I even like to recall them bickering. She had instructed him on how to hang the cord and where to place the poles. And he, in his wry, southern voice: Opinions are inexpensive, dear. beneath my pillow, muttering, father, father. Greek letters on wax paper hung like ghosts from the dormitory walls. I saw Alpha to Omega borne into buildings that galloped at me. Useless when a doctor muttered back, ten-year recovery. Most of all, I liked the possibility of forgiveness. I like it now. or a mare nudging a colt, guided by a logic that we can only witness. wrack and ribbon. They took what little I had. The county jail. Silent as a brick, stiller than God. I crashed out on the bunk’s logic, its rectitude. Rectitude. What a strange word for dead monks to thrash about. from a sacred book. His boots propped on the desk. His words scattered by an oscillating fan. reverent as the edges of morning glories, a reckoning. their terrible fates blowing against these crooked trees. Raphael Maurice is a translator and poet. 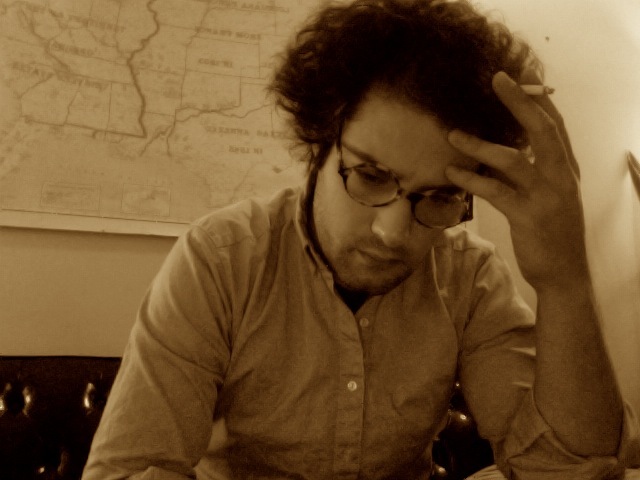 His work appears in the UCity Review, Likestarlings, River Bluff Review, Piecrust, and Monkeybicycle. He is a graduate of Southern Illinois University at Edwardsville, where he studied poetry. He lives in St. Louis with his wife, Jill Elizabeth Maurice. I give thanks to this voice fated for song. I very much enjoyed reading these poems.